Gentle iron folic acid, vit B12 which contribute to the reduction of tiredness & fatigue. Iron contributes to normal formation of haemoglobin & red blood cells. UK's no 1 iron supplement brand. Slow release delivery system. Designed to be gentle on the stomach. No fat or salt. Gluten free. No artificial colours. No preservatives or yeast. Feroglobin is not tested on animals. Food Supplement Gentle Iron to help support your haemoglobin & red blood cells Iron is an essential mineral, which contributes to normal formation of red blood cells and haemoglobin, as well as normal oxygen transport in the body. In addition to being vital for your blood, iron also contributes to normal cognitive function and immune system function. Iron is important for several functions in the body, but sometimes our diets are not well balanced and everyday activities, even drinking tea or coffee, may inhibit iron absorption. 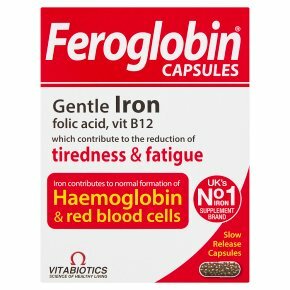 Feroglobin® Capsules provide an effective source of essential nutrients alongside iron including folic acid, vitamins B6 and B12 which help to reduce tiredness and fatigue. This unique combination is suitable during pregnancy and for women during the monthly cycle. Athletes may also benefit from the nutrients found in Feroglobin® Capsules. Feroglobin® is designed with a special slow release delivery system to prevent excess iron in the stomach. It ensures that the release of blood forming nutrients is gradual and even. Moderate but effective level of iron Iron in an organic compound form Slow, gradual release of iron into the body Feroglobin® Capsules has been formulated with a slow release action which is designed to be gentle on the stomach. Directions One capsule per day with your main meal. Swallow with water or a cold drink. Not to be chewed. Do not exceed recommended intake. Only to be taken on a full stomach. Feroglobin® Capsules can be continued for as long as required. This formula replaces other Feroglobin® products. Food supplements must not replace a varied and balanced diet and a healthy lifestyle.<br>As with other food supplements, consult your doctor or pharmacist before using if you are under medical supervision, have epilepsy, haemochromatosis, suffer from food allergies, or are allergic to any of the ingredients. Not suitable for children.<br><br>This product contains iron, which if taken in excess, may be harmful to very young children.